If there is any genre of videogames that I enjoy most it has to be RPGs. And this is mainly due to the large amount of really cool and awesome knights you can find in these games. Until recently, I had never played Fire Emblem and I was undoubtedly interested in playing Fire Emblem Awakening after receiving a Nintendo 2DS for Christmas. One of the best characters and knights in the game is Frederick, the Great Knight and bodyguard to the prince and princess. Having little experience with Fire Emblem (Aside from playing the gamecube game) I was a bit underclassed on normal difficulty. My warriors, knights, and mages would all undoubtedly fall by the wayside as they attempted to stem back the hoards of enemies that would attack. Luckily, the game gives you this Goliath to start out with: The knight known as Frederick. 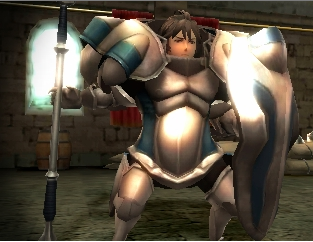 Frederick is so insanely overpowered that he squashes almost all resistance rather easily. He barely ever takes damage, he dishes out a lot in return and is able to wade through armies single-handedly. A lot of my strategies would involve me throwing Frederick against an entire army while my other guys snuck around and murdered the general. They would spend all their time attacking Frederick AKA “Fred” and getting slaughtered that I would be able to take out their leader no problem. And it continued like this up until the end of the first part of the game. In a battle against an evil king and his army, Fred actually started taking damage. I freaked out when this first happened, as Fred has never really taken that much damage before. This guy has been making swiss-cheese out of entire battalions of soldiers and suddenly those very same soldiers could do 6-7 hit points of damage to Fred in one hit. Once I sent Fred against the king, he was effortlessly murdered. Luckily, I was playing on casual which disables perma-death so I didn’t lose him permanently. Still, it was weird how my favorite character in the game could go down so easily when no other general he has come up against has managed to damage. In the next level, Fred was back to normal. He was overpowered, barely taking damage and being a badass. And after that, Fred became underpowered again. Enemies now dealt 11 hit points per attack to Fred. In short, Fred was probably the best character I had early on but quickly became just another soldier after 5-6 hours of gameplay. Fred was just there to be an overpowered troop unit to help ease gamers into the combat and strategy. And after Fred stops being useful, you rely on the other troops more. In a way, Fred makes you apreciate your army more. Your one-man-army becomes just one-man, but that one man paved the way for the growth of a battalion into a fully-fledged army. And that’s something I will always appreciate.